This test detects all four variants of the ACAN gene. → Abnormal cartilage growth leading to skeletal problems and dwarfism. Four causative variants for ACAN dwarfism have been identified and validated to date: D1, D2, D3* and D4. 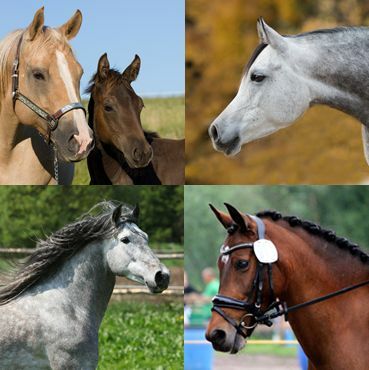 All variants show similar phenotypes and lead to dwarfism in Miniature Horses and Shetland Ponies. An affected pony may have two of the same, or two different variants. Any combination with D1 results in early spontaneous abortion of the affected foal (D1/D1, D1/D2, D1/D3, D1/D4). Other combinations show the phenotype described in “Symptoms”. Symptoms may vary from mild to severe. 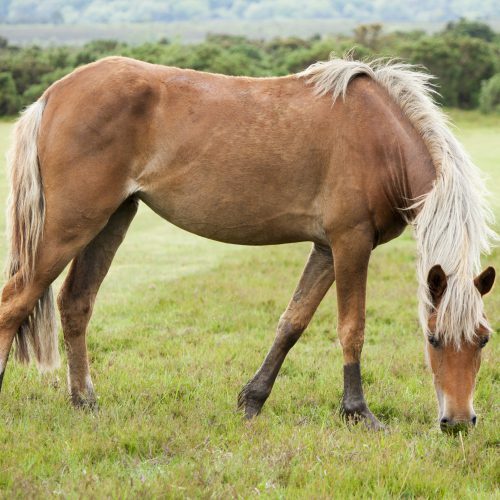 Affected ponies are often euthanized due to poor quality of life. Some combinations are very rare (D3/D3, D4/D4). The effects of these genotypes on the appearance of the disease are yet unknown. Originally five different variants were reported to cause the ACAN dwarfism. The original D3 variant has been proven incorrect, and the fifth variant reported (Metzger et al. 2017) has been named D3*. CAG tests for this corrected D3* variant. Another form of dwarfism also results in health issues in Shetland Ponies and Miniature Horses: Skeletal Atavism (SA, Del-dwarfism). It is possible for ponies to be carriers of both ACAN and SA. → ACAN-Dwarfism is an autosomal recessive hereditary disease, meaning that horses with only one copy of the genetic variant (N/d) are clinically normal carriers while horses with two copies of the genetic variant (d/d) are affected. N/N normal. 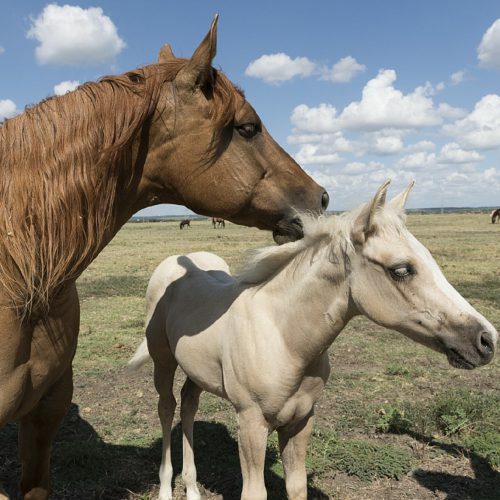 The horse does not have any copies of the genetic variants causative for the ACAN-Dwarfism and therefore cannot pass them on to any offspring. N/d a carrier. The horse is a clinically normal carrier. It has one copy of any of the genetic variants causative for the ACAN-Dwarfism and will pass it on to its offspring with a probability of 50%. d/d affected. The horse has two copies of any of the genetic variants causative for the ACAN-Dwarfism and will pass it on to all offspring. All offspring will be carriers (N/d). Any combination with the D1 variant will lead to early abortion of the affected foal. Carriers may be bred to normal animals (N/d x N/N) without any risk of producing affected offspring. The offspring should also be tested before breeding to determine if they are carriers or normal. Breeding two carriers (N/d x N/d) is not recommended due to the possibility of 25% of the offspring being affected. Affected animals (d/d) should not be used for breeding. Eberth, J.E. : Chondrodysplasia-Like Dwarfism in the Miniature Horse. Theses and Dissertations–Veterinary Science. Paper 11. Entire thesis is available at http://uknowledge.uky.edu/gluck_etds/11:, 2013. 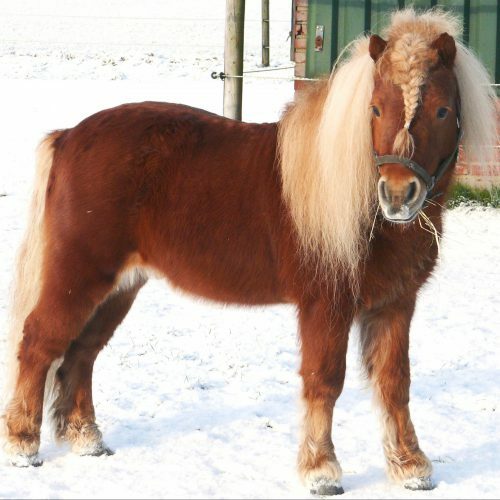 Metzger, J., Gast, A.C., Schrimpf, R., Rau, J., Eikelberg, D., Beineke, A., Hellige, M., Distl, O. : Whole-genome sequencing reveals a potential causal mutation for dwarfism in the Miniature Shetland pony. Mamm Genome 28:143-151, 2017. Pubmed reference: 27942904. DOI: 10.1007/s00335-016-9673-4.